London: Pakistan captain Sarfraz Ahmad said he felt both surprised and proud after his inexperienced side outplayed England during a dominant nine-wicket win in the first Test at Lord’s. Victory, completed before lunch on the fourth day, put Pakistan 1-0 up in a two-match series ahead of the second Test at Headingley that starts on Friday. Pakistan’s batsmen and bowlers applied themselves to the demands of playing an early season Test in English conditions far more effectively than the home side. They caught better too, with England dropping several chances. Man-of-the-match Mohammad Abbas led Pakistan’s attack with an overall return of eight for 64, while four Pakistan batsmen hit fifties in a competitive first-innings 363. “Yes, I am very surprised,” said Sarfraz. Wicket-keeper Sarfraz led from the front in the field, holding an excellent diving catch to dismiss Dawid Malan on Saturday. It was one example of the team’s much sharper performance after their shoddy display during this month’s five-wicket win over Test debutants Ireland in Dublin, with Sarfraz saying it was a “credit” to the work of Pakistan fielding coach Steve Rixon, the former Australia wicket-keeper. “Ireland gave us a tough time and that helped us prepare for this Test,” Sarfraz added. Meanwhile the modest Sarfraz, who led Pakistan to a brilliant victory over arch-rivals India in last year’s Champions Trophy one-day final across London at The Oval, played down his captaincy skills. Sarfraz instead praised coach Mickey Arthur, who took charge two years ago and promptly guided Pakistan to a 2-2 draw in a four-Test series in England, for “taking the players along with him” — something he had also tried to do as skipper. 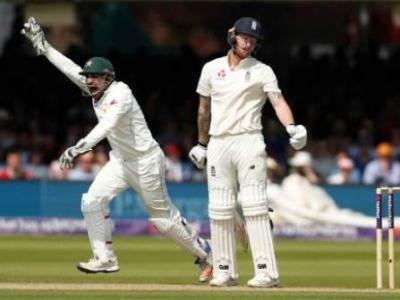 Mohammad Amir has had both some of his best and worst days at Lord’s, getting on the honours board in 2010 in a Test where he was involved in a spot-fixing scandal that saw the Pakistan paceman jailed and banned from cricket for five years. He returned to help beat England at Lord’s two years ago and was involved again in this win, Pakistan’s fifth Test-match victory at the ‘home of cricket’. The responsibility of being the senior bowler appeared to weigh heavily on the 26-year-old, however. But after just one wicket in England’s first innings, the left-armer took four for 36 in the second. “There was pressure on him,” said Sarfraz. “But we had that belief that he will come good. Inzi (Pakistan selection chief and former Test batsman Inzamam-ul-Haq) talked to him one-on-one and then Mickey talked to him, I spoke to him. “The way he responded was great.